To many people Lowestoft is usually associated with the fishing industry and tourism, both of which were originally heavily dependent on the railway to provide the necessary transport links to the town. However, in addition to providing a means of travelling to and from the town, the railway had a major presence in Lowestoft, providing much employment, with their many works and depots. It was very much a railway town, a fact that has been overlooked for a great many years. The majority of books published, both local and national, have virtually ignored this fact. The town provided essential materials to maintain Britain's railway infrastructure. The Lowestoft Train is by far the most comprehensive book ever published on the subject, and is bound to be of interest to transport enthusiasts, local people and others interested in railways generally. Not only does the book cover the complex railway networks in Lowestoft, but it also features in detail the three rail routes to Norwich, Ipswich and Great Yarmouth, that have served the town. Local historian Peter Killby has contributed to the book with a very interesting account of his many rail journey experiences in the 1930s and 1940s from Lowestoft. His vast knowledge of the railway timetables at that time is well demonstrated in this section of the book. The book, which is a limited edition, has 108 pages and contains 190 photographs of which 23 are in colour. In addition, there are 18 historic illustrations. A very good photographic cross section of the railway infrastructure on the local lines is contained in the book, as well as a superb selection of trains hauled by steam and diesel locomotives from around 1885 to the present day. Listed in date order are comprehensive details of the development of the railway infrastructure in and around Lowestoft from 1831 to 2002. The cost of this quality publication, which has the same dimensions as previous books in the series, is only £9.25. This remarkably low price is achieved by producing it in house, without the involvement, overheads and profits of commercial publishers and authors. 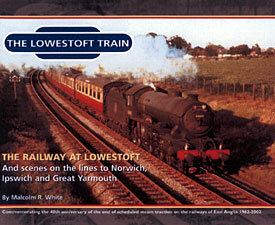 The Lowestoft Train can be ordered direct from Coastal Publications and is available from any good bookshop. 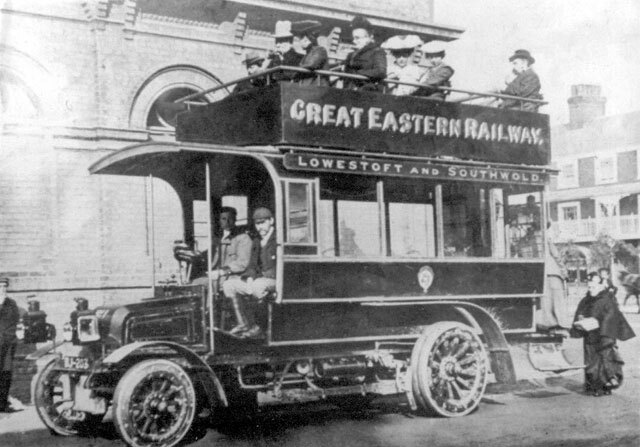 A Great Eastern Railway bus working the Lowestoft - Southwold service. 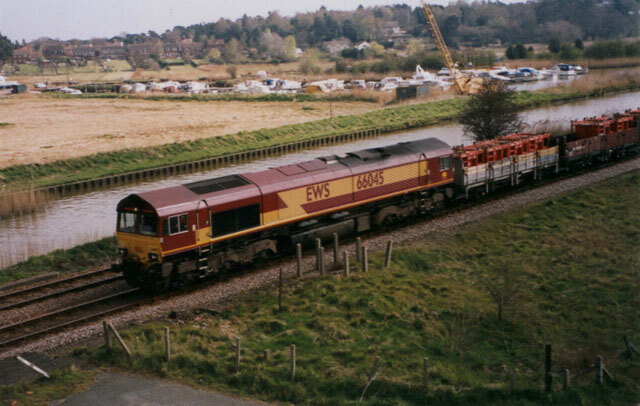 On the 8th April 2002, Class 66 No. 66045 passes Haddiscoe with a freight from Lowestoft. 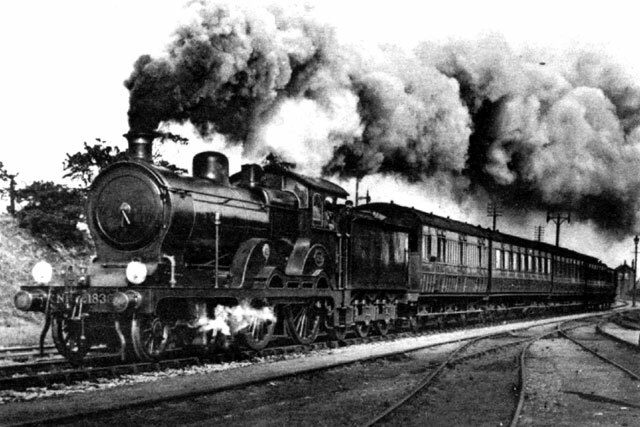 A "Claud Hamilton" locomotive leaves Lowestoft with an express. 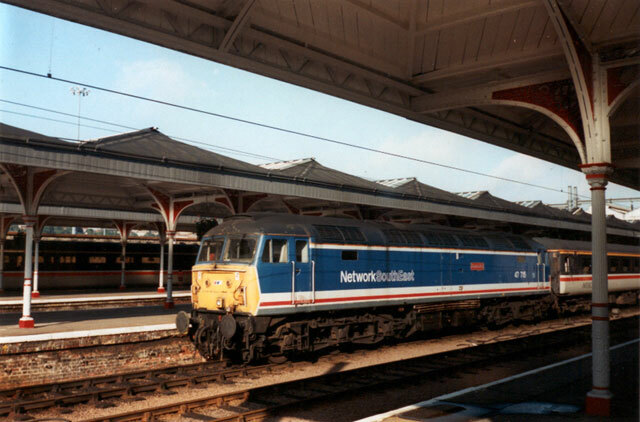 Class 47 No. 47715. Waiting to leave Norwich with a Lowestoft train.